A new luxurous hotel with much to offer in terms of recreation, tourism, sports. 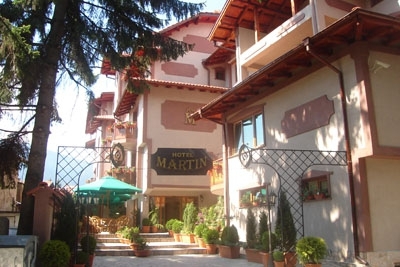 Martin hotel is situated on a quiet street, not far from Bansko’s old town and town centre. It is the chief aim of both management and personnel to welcome their guests and make them feel at home by offering them high quality accommodation and giving them the chance to try some home-made dishes prepared by excellent cooks with fruit and vegetables grown in the hotel’s own garden and conservatory. The hotel also offers its guests bike rides following picturesque routes up the mountain, buggy rides, visits to a horse-breeding farm, dancing bear park in Belitsa, tourist outings with guide and transport to lakes, peaks and unique natural phenomena, fishing, sightseeing trips to places of religious and architectural interest. Spoken languages: Bulgarian, Russian, English, German, Arabic.